Captain Walter Reid Barrie .The Royal Scots Borderers, 1st Battalion The Royal Regiment of Scotland was shot and killed in an ‘insider attack’ at Forward Operating Base Shawqat in the Nad ‘Ali district of Helmand Province on Sunday, 11 November 2012. Lieutenant Edward Drummond-Baxter.1st Battalion The Royal Gurkha Rifles. Lance Corporal Siddhanta Kunwar . 1st Battalion The Royal Gurkha Rifles. Shot and killed by a man wearing Afghan Police uniform at a checkpoint in the Nahr-e Saraj district of Helmand province on Tuesday, 30 October 2012. Corporal David O’Connor. 40 Commando Royal Marines. Corporal Channing Day. 3 Medical Regiment. Royal Army Medical Corps. Captain Carl Manley. Royal Marines. from what are believed to be natural causes. Captain James Anthony Townley. Royal Engineers. Died in Camp Bastion, on Friday, 21 September 2012, from wounds sustained whilst serving at Forward Operating Base Shawqat. Sergeant Jonathan Eric Kups. Royal Electrical and Mechanical Engineers (REME). Died in Camp Bastion, Helmand Province, Southern Afghanistan on Friday, 21 September 2012. Were shot and fatally wounded by a rogue Afghan Local Policeman in Checkpoint Tora in the Nahr-e Saraj district of Helmand province on Saturday, 15 September 2012. Lance Corporal Duane Groom .1st Battalion Grenadier Guards. Killed on Friday, 14 September 2012 when the vehicle he was traveling in struck an Improvised Explosive Device in the Nahr-e Saraj district. Deployed with a Police Advisory Team was on patrol with the Afghan Uniform Police when the Ridgback in which he was traveling struck an improvised explosive device and he was killed on Sunday, 9 September 2012 in the Nahr-e Saraj district of Helmand province, Afghanistan. Guardsman Karl Whittle. 1st Battalion Grenadier Guards. Died in Queen Elizabeth Hospital Birmingham on Friday, 7 September 2012 from gunshot wounds he sustained when his checkpoint was attacked by insurgents in the Nahr-e Saraj district of Helmand province on 14 August 2012. Guardsman Jamie Shadrake. Recce Platoon, 1st Battalion Grenadier Guards. Died of gunshot wounds when his checkpoint was attacked by insurgents in the Nahr-e Saraj district of Helmand province on Friday, 17 August 2012. Lance Corporal Matthew David Smith. Royal Engineers. Killed in the Nad ‘Ali district of Helmand province when he was hit by small arms fire on Friday, 10 August 2012. Lieutenant Andrew Robert Chesterman. 3rd Battalion The Rifles. Killed in the Nad ‘Ali district of Helmand province when he was hit by small arms fire on Thursday, 9 August 2012. Guardsman Apete Saunikalou Ratumaiyale Tuisovurua .1st Battalion Welsh Guards. Killed in a small arms fire incident at Checkpoint Kamparack Pul in the Nahr-e Saraj district of Helmand province, Afghanistan on Sunday, 1 July 2012. Fatally wounded when leading his section forward to assist a group of Afghan soldiers who were pinned down following an insurgent ambush on Friday, 15 June 2012. Killed in Afghanistan on Wednesday, 13 June 2012. Killed in Afghanistan after coming under fire in the Nahr-e Saraj district of Helmand province on Sunday, 3 June 2012. Corporal Michael John Thacker. 1st Battalion The Royal Welsh. Killed in Afghanistan after coming under small arms fire in the Nahr-e Saraj district of Helmand province, on Friday, 1 June 2012. Killed when the vehicle he was traveling in was caught in the blast from an improvised explosive device while on patrol in the Nahr-e Saraj district of Helmand province on Saturday, 26 May 2012. Killed by small arms fire while deployed as part of a Police Advisory Team to attend a meeting at the local Afghan Uniform Police headquarters near Patrol Base Attal in the Lashkar Gah district of Helmand province on Saturday, 12 May 2012. Private Ratu Manasa Silibaravi. 23 Pioneer Regiment, The Royal Logistic Corps. Killed in Afghanistan on Friday, 4 May 2012 during an indirect fire attack on their Forward Operating Base in the northern part of Nahr-e Saraj district. Guardsman Michael Roland, 1st Battalion Grenadier Guards. Fatally wounded during an exchange of small arms fire whilst deployed with his company on a three-day operation to disrupt insurgent activity in a contested area in the north of Nahr-e Saraj district on Friday, 27 April 2012. Died on 18 April 2012 at Queen Elizabeth Hospital, Birmingham. He had been seriously wounded in a blast from an improvised explosive device on Wednesday, 11 April 2012. Corporal Jack Leslie Stanley. Queen’s Royal Hussars. Died at the Queen Elizabeth Hospital in Birmingham on Sunday, 8 April 2012 of wounds sustained in an explosion in Afghanistan on Friday, 3 February 2012. Sergeant Luke Taylor. Royal Marines. Lance Corporal Michael Foley. Adjutant General’s Corps (Staff and Personnel Support). Were shot and killed at the main entrance to Lashkar Gah Main Operating Base in Helmand province by an Afghan National Army soldier on Monday, 26 March 2012. Captain Rupert William Michael Bowers.2nd Battalion The Mercian Regiment. Was leading a patrol to clear a position of the threat of insurgents in the Mirmandab region of Nahr-e Saraj district, Helmand province, on Wednesday, 21 March 2012, when he was killed in the blast from an improvised explosive device. Sergeant Nigel Coupe. 1st Battalion The Duke of Lancaster’s Regiment. Were killed when there Warrior armoured vehicle was struck by an improvised explosive device in the Lashkar Gah Durai region on Tuesday, 6 March 2012. Senior Aircraftman Ryan Tomlin, 2 Squadron RAF Regiment. Was taking part in a partnered patrol to reassure and interact with the local population in the Nad ‘Ali district of central Helmand province when he was fatally wounded by small arms fire during an insurgent attack on Monday, 13 February 2012. Serving with 1st Battalion The Yorkshire Regiment, was killed on Friday, 27 January 2012 when his foot patrol to disrupt insurgent activity came under small arms fire in the Khar Nikah region of the Nahr-e Saraj district of Helmand province. Signaller Ian Gerard Sartorius-Jones,20th Armoured Brigade Headquarters and Signal Squadron (200), died on Tuesday, 24 January 2012 at Forward Operating Base Khar Nikah in the Nahr-e Saraj district of Helmand province. Rifleman Sachin Limbu, 1st Battalion The Royal Gurkha Rifles. 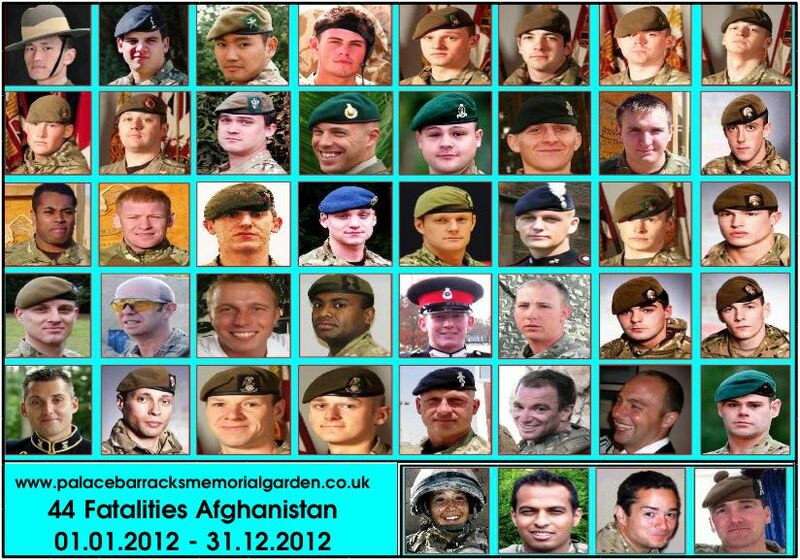 Died on Monday, 2 January 2012, at the Queen Elizabeth Hospital in Birmingham, of wounds sustained in Afghanistan in June 2010. Firstly, my congratulations on this wonderful Memorial site. Just one (very slight) point which I know would be appreciated by all his colleagues and members of his profession (past and present). Cpl Brent John McCarthy (treacherously killed 12 May 2012) was a proud member of the Royal Air Force Police (RAFP) and it would be a wonderful gesture if his Roll of Honour listing reflected the fact.